Oil-Electric: PGE - Prince George Eventually! Quesnel, BC, Mile Post 384.3, Prince George Subdivision, November 26, 1959. It’s difficult to think that I took these photos 48 years ago, because I don’t feel old! These photos were taken when our family is in transit back to Seattle, after three remarkable years living in Prince Rupert, BC. My Dad knew it was important for me to grab these photos on our way south. He really supported my photography of trains. So we stopped for about a half hour, and I documented a slice of PGE history. Quesnel is roughly 1/3rd of the way between PGE - Pacific Great Eastern’s Mile Post zero in North Vancouver, BC, and end of track at Fort Nelson in the Peace River Country, Mile Post 728.4. north of North Vancouver, and some 262.5 miles north of Prince George! An article in Trains Magazine years ago, spotlighting the PGE, remarked on the roller coaster track profile of the PGE, through the gut of British Columbia. Up to 2.2% ascending and descending grades that were rough on brake shoes! Birthing as Howe Sound and Northern, the Province of BC (hence, the public) took over in 1918, as Pacific Great Eastern. Lovingly referred to as “Please Go Easy” or, my favorite, “Prince George Eventually” the line conjured up profits hauling wood products and service to hinterland communities. 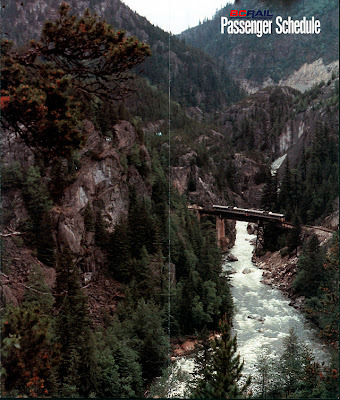 Tumbler Ridge coal came in later years, when the name had been changed to BC Rail in 1972. 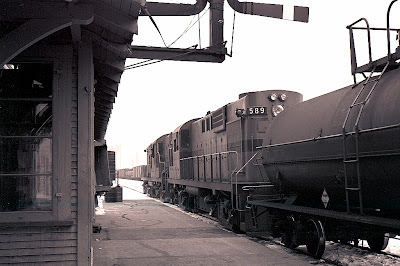 MLW - Montreal Locomotive Works (Canadian American Locomotive Company) supplied the bulk of locomotives to the line, with their asthmatic four-cycle motors. At throttle-up, they sounded like they were going to disintegrate! Rail connoisseurs held the PGE in awe, as the Caribou Dayliner, First Class 1 northbound, First Class 2 southbound, service passed through some of the most remarkable scenery in North America. Passenger schedule shows a tremendous scenic view. 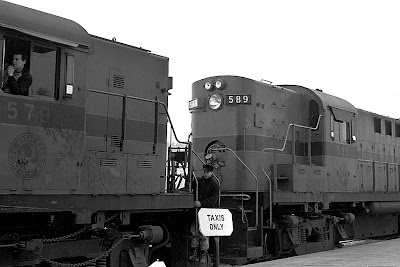 The Budd RDC’s (Rail Diesel Cars) were an efficient means of travel, which served the dozens of communities well for many years. 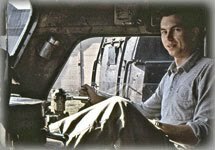 For an in-depth look at the world class Budd cars, go to "Interesting Web Sites." But there was a Change in the Wind. A master plan was brewing. In 2004, Canadian National bought the operating rights, NOT the roadbed upon which the rails lay, for 1 Billion (B as in Billion) Canadian Dollars. The roadbed upon which the steel lays is still owned by the Provincial Government (hence, the Public.) Purchasing these track rights gives CN a direct link from Prince George to Vancouver, as part of the massive investment in the Prince Rupert Container Port. See previous entries on that subject. 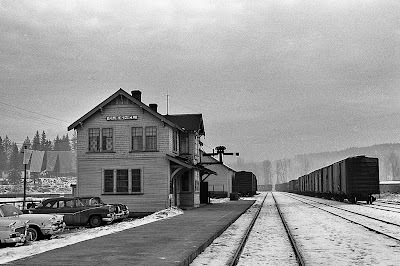 So here we are at Quesnel on a god-awful cold day in November 1959. A close examination of the station reveals two things. One, frozen sheets on the clothes line to the left of the structure, and two, the Train Order paddles are set to stop trains for paperwork. Conductors to sign clearance forms and pick up train orders. Train order signal brings northbound Third Class #25 PGE 579 +589, ker-lunking to a halt for signatures. Conductor, sporting a nifty cap, is ready to step ashore. Notice the spill on side of lead engine. Whatever it is, that fireman never made eye contact with me ... obviously he’s been chucking coffee out the window! Paper work done, conductor is back on board and Third Class freight #25 resumes her northbound journey to Prince George. She immediately leans into 12.5 miles of 2% grade up to Cotwood. As the hogger pulls the throttles open, these MLW's make one heck of an asynchronous, agonizing rumble that characterize the four-cycle motor! Railroader Stuff: PGE 579, RS-10 (Canadian Version MLW of Alco DL-700,) 1600hp, built 1956, SN 81537, wrecked 12/85, scrapped 1986. PGE 589, RS-18 (Canadian Version MLW of Alco DL-701,) 1800hp, built 1958, SN 82509.